Nordic Noir and Scandinavian Mystery have taken the world by storm but what’s behind the success? Are our Scandinavian societies hotbeds for murders and crime? Meet the authors behind the crimes and find out for yourselves! Nordic Noir Talks is a series of talks and author meetings at the Stockholm bookshop. Advance tickets (60:- incl refreshments) are available at the bookshop in Stockholm or online from billetto.se (see ticket links below). Limited seating – get your ticket today! The Hammarby Series novels let us follow Detective Inspector Conny Sjöberg and his murder investigation team at the Hammarby police in Stockholm. A gripping feast for all fans of Jo Nesbø, Camilla Läckberg and Henning Mankell. So far three of her eight novels in the series have been translated into English. » Tickets online at www.billetto.se/nordic-noir-gerhardsen or at the bookshop. The Stockholm Noir trilogy has already become a phenomenon in Sweden and abroad. His own professional experience as a criminal defense lawyer has given him unusual insights into a world that most people would rather not acknowledge. Critics have tagged him ”a Swedish James Ellroy”, a truth-telling author who writes about life on the streets and depicts the underbelly of Swedish society. Released just in time for the talk: Stockholm Delete. » Tickets online at www.billetto.se/nordic-noir-lapidus or at the bookshop. The Sandhamn Murders series makes us wonder: What secrets can an idyllic island hide… The enormously popular series has been made into a successful TV miniseries that has been broadcast around the world and more than 4 million copies of her books have been sold. The third book in the series, Guiltless, is to be published just before the talk. » Tickets online at www.billetto.se/nordic-noir-sten or at the bookshop. Sweden – a haven of tranquility and benevolence or a cesspit of corruption and dastardly deeds? One thing’s for sure: it has captured the imagination of crime fiction enthusiasts around the world. From the pretty little coastal villages in the south to the wide open expanses of the north, Sweden has become the setting for some of the most intriguing crime writing in modern time. 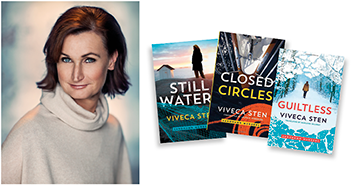 Prepare for a spine-chilling adventure as we investigate the famous people and places that have made Sweden a crime fiction wonderland together with Anita Shenoi (author of several books on Sweden) and Gabriella Ullberg Westin (author of the Swedish crime series Murders in Hudiksvall). » Tickets online at www.billetto.se/nordic-noir-sweden or at the bookshop. The Öland Quartet – dark mystery novels with some supernatural overtones, which mainly take place on the Swedish island of Öland; a small island in the Baltic Sea and a sunny and popular place for tourists to visit in the summer. In the winter however the island is dark and cold and very few people live there. The quartet covers the four seasons on the island. The stand-alone psychological thriller The Asylum takes place on the Swedish west coast. » Tickets online at www.billetto.se/nordic-noir-theorin or at the bookshop. The Leo Junker series – about a young police officer teetering on the edge of the law, crippled by both trauma in the past and bad judgment in the present. Although Leo can't let go of the crimes he must investigate, his obsession isn't due to some deep sense of duty; Leo is haunted by the crimes because they in some way seem to be about him. To be released this summer in English: October is the Coldest Month, a young adult mystery. » Tickets online at www.billetto.se/nordic-noir-carlsson or at the bookshop.